That’s great, but how do I get it home from the Library? The Earth Platinum world atlas is about to start shipping this February, and UPS drivers around the world are quaking in their boots, booking vacation time and frantically planning their ‘sick’ excuses. That’s because it opens to 6′ x 9′ and weighs 120kg – over 260lbs (34lbs heavier than the author of this post at time of writing) and according to publicity materials at its world premier at Frankfurt in 2010 “Never has the envelope been pushed this far”. Quite literally if you are planning to get it shipped via priority mail. The project was inspired by the Klencke Atlas, which we wrote about back in May 2010 when it was included in a collection of unusual maps on display at the British Library. It was presented to King Charles II in 1660 and nothing like it has been produced since. Platinum includes the work of more than 100 international cartographers as well as stunning photography and is hand bound. According to Millenium House it is set to become “a prized reference and a focal point of the world’s major libraries and repositories.” Of course with health and safety laws being what they are in most public buildings, it will need a dedicated member of staff to turn the pages, and only after a risk assessment has been completed. I have already placed a loan request at my local library but I’m not sure how long I will have to wait. 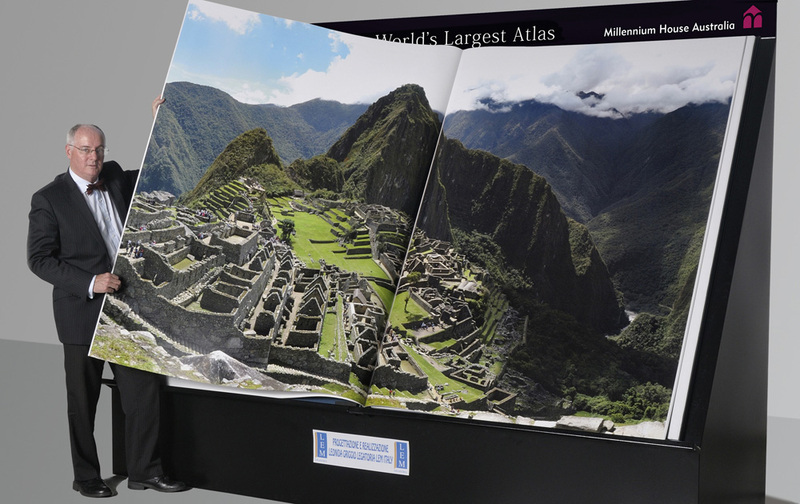 Average sized man stands by giant atlas. I considered ordering a copy even after I saw the US $100,000 price tag, but when I saw the price of appropriately sized coffee tables in Ikea I realized this was completely out of my comfort zone. However, if you are looking to splash the cash on the map geek in your life, you can join the waiting list here – make sure you have your Amex Triple Gold Card to hand for faster service. Is it alright to put a portion of this in my personal weblog if I post a reference point to this web-site?